Second PSU reading +17.8v and -17.9v when connected to the amp. Despite having one working PSU I'm still not seeing any reading across 0 1R on the amp board.....well that's not strictly true, when I put my multimeter across it the voltage drops to zero. It was only reading a few mv before it dropped though. I have the DC pot set to half way. Is the amp getting warm? Fuses look fine. Pins 7 and 4 stabilise at 9v. It drops from about 11.5v when the amp is turned on. The amp is not getting warm. I may be misunderstanding what you are trying to do but the DC pot is to adjust DC levels on the output. 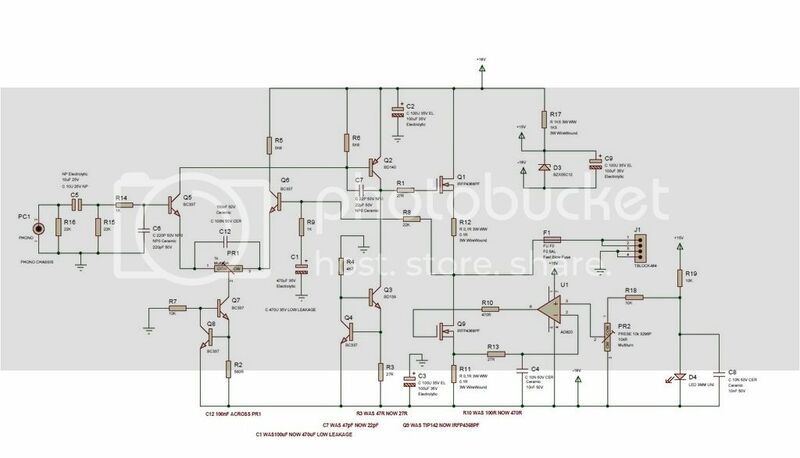 The other pot marked Current Adjust is used in conjunction with the .1R resistor, it will read initially Zero if the pot is fully anti-clockwise. So if I am correct then put the meter across R11 (0.1R) and twiddle the pot gently, you should start to get a reading. If I am not correct ignore the above. Hi Sondale. I had the DC pot set to halfway before I started adjusting the current adjust pot (with my meter across R11. When I adjust the current I see no change on my meter. I'd use the continuity setting on your multimeter to check the connections between the PSU and the SECA boards just to be sure that you have not cross wired something. putting a voltage to ground on one side may be causing the strange readings. it's a little hard to trace the wiring in the photos as the wires aren't colour coded but it looks like you may have a cross wire. positive and negative need to go to the outside terminals on the SECA board. I may be wrong but just to be sure. Thanks both I'll check in the morning. From the transformer to the PSU board: Yellow to AC1 Orange to GND Black to GND Red to AC2 From the PSU to the amp board: +V to AC GND to GND GND to GND -V to to AC Continuity between wires checked and they are all ok. I don't have anything connected to the speaker terminal at the moment. This afternoon I can wire this back up and report back. Transformer outputs are black and orange = 0v. Red and yellow = 18v. The way of wired it is hopefully as per Bens pic. DO nothing until we've had a think. on the SECA board what Value of R17 did you fit? As a suggested next step. Disconnect ALL connections between PSU and SECA boards. The SECA Board can be tested on it's own by connecting he transformer directly. The big plus of this design is it's modular construction so my take is test the PSU and SECA separately if at all possible which should make it easier to find and fix the problem. Lets see what Col recommends as the next step but I'd avoid powering up until we have a plan. It happens but the most important thing is to keep going and be methodical IMHO. 600v, 200v, 20v, 2v, 200mv. OK what range did you have it to read across the 0.1R resistor ? Also what voltage is on the 33,000uF Caps? Where can I read the cap voltage from? Simple on one of the centre pair of the 4 way power block is Zero , black neg prob there. Is the Green LED ON??? I've noticed that on a couple of builds that folks have taken the speaker connections from the amp board and not the connections on the p/s board. Does this make a difference? Yes. I built the amp initially without the PS boards, adding the PS boards some months later. Taking the speaker signal from the PS boards is a significant step up. C4 is removed. The green LED is on. Ok, with the COM probe of my meter on 0V and the red on -V I get -17.9v. Now when I lift the red probe and put it on either side of the 0.1R resistor I get +4.8v :-q. When I then put the red probe on the FET centre pin I see +17.3v. This is with the amp board fed from the PSU. OK check fuses on ohms with power off. 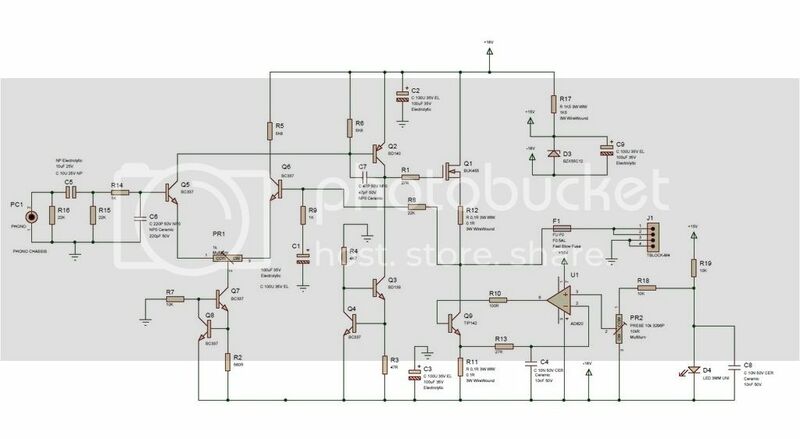 If OK check power on the pin of the PSU PCB if Ok then connection on Amp PCB. What device have yo fitted into Q9? And is both amp doing the same thing? if so a common error maybe. 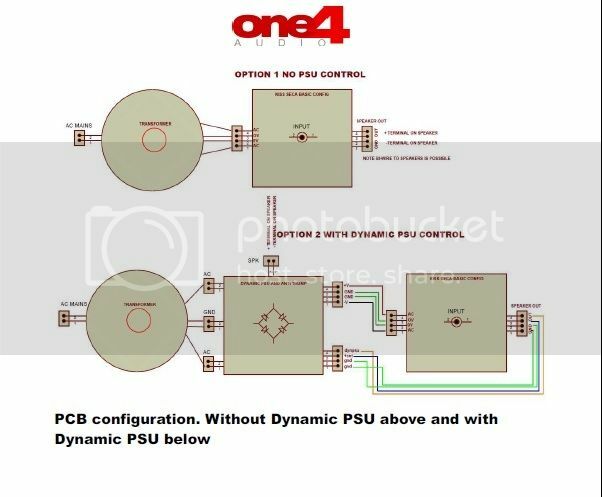 Note remove C4 and D3 is connected Kathode to pin 7 of U1 and the anode to pin 4 under the PCB NOT into D3 PCB position. I'll run through your other checks now. Q9 is one of these: http://uk.farnell.com/multicomp/tip142/darlington-transistor-to-247/dp/9294287 I'll run through your other checks now. That should be fine but note if you use a FET you get a wee bit more power.From 12W to 18W approx, due to a lower saturation voltage across the constant current that Q9 is part of . So use the same FET as Q1. And with the PSU it will peak to about 30W, not RMS as the last power level are, ie 12WRMS, 18WRMS, and with a very short burst like a symbol peaks of nearly 40W, this give this huge dynamic range and makes the amp sound like a big amp. On the retail version we can get 25WRMS but these and the circuit is not available as kits just ready made, and real sods to set up. Fuses all give same reading in ohms mode with power off. I'll remove the amp board and check zener position underneath....will post a pic but fairly sure it's in same location as shown in your pic. PS all above voltage measurements taken with current adjust fully anti clockwise and DC adjust at half way. If so is it the same on both PSU boards? Shall I try powering amp board direct from transformer? Will point to PSU fault if it works. I'd hold off on powering anything up just until Colin has some test points for you just to avoid any stress and give you some solid data to aim for. Measure the fuse on the negative side of the SECA board for continuity out of it's holder. Also post a link to the exact boom that you worked to as I remember a few changes when going from Darlington to FET. May I also recommend the use of ''Stunt speakers'' for testing. Any old cheapies from a charity shop (do check the impedance and avoid crazy loads) will do. I always use my stunts as the final test before connection to my PMC and I know that Keith uses them also. Then the horns can go on your new builds once they have proved reliable.I usually go for at least 5 days of stunts, powering the amp on and off a few times to make good and sure. It really does help take the stress out of first switch on. stunt speakers are at the ready. The bass driver on my H2's is long out of production so I intend to test using a very old pair of speakers first. With the PSU speaker outputs connected to the binding posts on my case, the LED goes out. I also only see 0.09v across the 1R resistor compared to 4.8v. Are your Binding posts isolated? That connection should not make any difference to the voltage measurements unless you have a short to ground. maybe check for continuity between your speaker binding posts and chassis just to be sure. James did a good job but a few thing went wrong parts now ordered and will be fixed. Well whoops is what first thing that come to mind. Firstly the device on the tag mounted to the FET is a Thermistor not a wire link, this killed the PSU and killed the FET and the AD820. Also the diodes DS1,2 are polrized you had fitted them the wrong way round so one died on each PSU board. Also the regulator chip LM337 died, not good so far. The PSU both now work, the amp need new FETS and new AD820 I have ordered them and they will be fitted. With luck in a few days it will all be singing. And Colin wants to turn me loose on one? BOOM! With hindsight I should have asked Colin to send me populated boards! Thanks for sorting them out Colin. No probs, I enjoyed it and learnt a few things. The bits should be here on Friday. I have put socket on the AD820,s as the track can get fragile , and pins for the thermistors.